Cooking is something that probably everyone has done in their lives, or at least attempted to do. But not all people fully understand the joy that can come out of cooking, unless you are a passionate chef who loves to experiment with new recipes, find new ingredients, taste test all of your good (and bad!) creations, and share them with others. And speaking of sharing your feed with others, there are many ways that you can prepare food for any and every occasion. Whether you simply want to season the chicken before it goes on the grill, need to soften a stick of butter before putting it into the batter, or like to freeze your bread to make sure that it doesn’t go to waste, you are still practicing a method to save, preserve, and prepare your food for later use. But have you ever had the experience of fresh fruit that you just picked up from the grocery store a few days ago already start to grow mold? Or, have you ever had food go bad unexpectedly, or when you store it in a dark and cool place, find that it’s so much moister when you take it out than it was when you put it in? If so, let me ask you one more question: have you ever thought about using a food dehydrator? The purpose of a food dehydrator is to essentially remove the moisture from foods and to dry it to the point where, although all of the water has been taken from it, all of the enzymes stay in place. All in all, the purpose of a food dehydrator is to preserve food so that it doesn’t go bad, to waste, or lose its quality by the time you share it with others or need it later. One of those food dehydrators is the Ronco Food Dehydrator, which promises to do just that, and comes with five trays for easy storage and sharing. But, does it do everything that it says it is going to do? How exactly does it work? And what do other customers think about it? I will be answering all of those questions and more in this guide to and review of the Ronco Food Dehydrator. What is the Ronco Food Dehydrator? How Does the Ronco Food Dehydrator Work? When I write these reviews, I value you as a reader and honesty, integrity, and accuracy are my number one priorities. I believe that as the writer, it is my responsibility to present you with a realistic view of the product, which means giving you both the pros and the cons. Also, I can guarantee you that I am writing this review with a completely unbiased opinion. My recommendation is based solely on what all the product has to offer, the reputation of the company and the product itself, the price and convenience to you as a potential customer, and most importantly, the customer reviews. In my opinion, nothing is better to base a decision on when considering a product than seeing what other people who have already tried it are saying. There is no such thing as a perfect product, which makes it realistic. But there is such a thing as the right one for you, and it is my hope that with this review, I can help you find it. So, are you ready to see if the Ronco Food Dehydrator is the right one for you? Because I’m ready to help. The overall goal of the Ronco Food Dehydrator, as with any other typical food dehydrator out there, is to preserve your food to make it last longer and taste better. But this food dehydrator has much more to offer, making it different from the rest. The Ronco Food Dehydrator is made up of 5 trays, where on each one you can store more foods. It is even said to be great for the storage of arts, crafts, and other little DIY projects. Something great about the 5 trays of the Ronco Food Dehydrator is that it makes it easily portable as well, as you can use it for inside your kids’ lunchboxes, a serving size for a snack, or an easy way to deliver some delicious food to friends and family. Another pro to the Ronco Food Dehydrator is that it isn’t noisy at all. Instead, this food dehydrator stays quiet, but still gives your food the same convection heat drying treatment it needs to stay dry and preserved. Furthermore, it is very easy to use, as you simply chop up your fruits or any other foods, and then slide them in on one of the trays. Plus, you don’t need to worry about how well this food dehydrator will do in your dishwasher — the Ronco Food Dehydrator, as well as all five of its trays, fit perfectly into an average dishwasher rack and its material is completely dishwasher safe. So, now that you know what the Ronco Food Dehydrator promises to do and all that it can be used for, it’s time to discuss how it actually works. As a food dehydrator, it uses heat to dry out the food that is being stored inside. Many food dehydrators use fans and air vents, as well as food trays and a heating element, which is what the Ronco Food Dehydrator uses. Regardless of which systems or elements the food dehydrator uses, all dehydrators have one thing in common: it utilizes them to make the air circulate in a way that removes all of the moisture from the food that is being stored inside, therefore causing it to dehydrate. However, the heat does something even more remarkable: although it removes the moisture from the food, it releases it into the dehydrator itself. The type of heating that the Ronco Food Dehydrator uses is called convectional heating. This means that during the process of removing the moisture, the dehydrator is completely quiet, but still very effective. The five trays in the Ronco Food Dehydrator have all been approved by the FDA, and specifically for food contact, meaning that it won’t deteriorate like others. Plus, the plastic that makes up the dehydrator completely free of BPA, making it much safer. Let’s be honest… perhaps the biggest influencer on our decision as to whether we make a purchase or not is the price of the product. So, now that you know all about what the Ronco Food Dehydrator says that it can and will do, what it can be used for, and how it does all of it, I think it’s only suitable for us to talk about the actual price of this product now. Although the Ronco Food Dehydrator is produced by the company Ronco, I have not been able to find the company’s official website after a numerous amount of research, which has lead me to believe that perhaps they don’t have one. But, Ronco does have an Amazon seller account, where they sell the Ronco Food Dehydrator on Amazon. On Amazon, the Ronco Food Dehydrator is sold for a price of $54.52, and with free shipping. In my opinion, I think that this is a very fair price for all that the Ronco Food Dehydrator does, the amount of storage that comes with it, and the rating (which I will discuss in the next section). Compared to a few other dehydrators in its competition, the Ronco Food Dehydrator is practically offering you a steal. 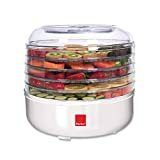 I have seen food dehydrators get as high as $200 or more for almost the same quality. Make portable snacks for lunchboxes, trail snacks, or just on-the-go! You know about everything that the Ronco Food Dehydrator has to offer you, as well as how much of your money it is asking for. But is it really worth your investment? In my opinion, the best place to find out the answer to this burning question is to go to none other than the customer reviews section. After all, these are people who have already spent their money on this product and have used it before you, so they are the ones who actually put it to the test. So, what are the previous customers of the Ronco Food Dehydrator saying about it? Are they recommending you buy it too, or are they warning you to spend your money somewhere else? First of all, the Ronco Food Dehydrator has an overall rating on Amazon of 3.4 stars out of a maximum 5 stars, and making up that number is a grand total of over 500 reviews so far. While this is definitely not the greatest rating, it does mean that a lot of customer opinions have been shared. One customer in the reviews section says that they are more than disappointed in the Ronco Food Dehydrator. In fact, the customer goes on to say that the reason for this was mainly because two of the five trays actually melted from the heat after being used only twice. Overall, the customer said that the dehydrator was just made very cheaply. Another customer says that the same thing happened to her a few months after she bought it, except all of her trays have now melted. She said that she had called Ronco to report the incident, and they wanted her to purchase a new food dehydrator from them as a replacement. In my opinion, that not only shows the low quality of the product, but also the characteristics of the company that sells it. I went onto read 5 more reviews about the Ronco Food Dehydrator, all of which were one-star ratings and complained of their trays melting. Other customers say that it has worked completely fine for them, other than a little confusion when they first received it. Apparently, the Ronco Food Dehydrator does not come with a user’s manual, making it very hard for people to put together and confusing as to how it works. After reading these reviews, I started to notice a trend: most of the recent reviews, left in 2016 to 2017, were giving one-star ratings and complaining of the trays melting, whereas the older reviews seemed to be more positive. Perhaps Ronco has changed the making of the product a bit, but that is just a hypothesis. It is clear to me that the quality of the Ronco Food Dehydrator is just as cheap as the price. While the rating on Amazon is definitely not one of the worst ratings I’ve seen, the recent customer reviews make it seem like it should be rated way less. At first, I was beginning to really like this product. But then, I read the customer reviews, and like I said, those are what shape my opinion of any product the most. In my opinion, I feel like the Ronco Food Dehydrator definitely has a lot to offer and it has a great number of features that sets it apart from the others in the marketplace. But, I also think that if only the quality of all of its features were as good as it should be, then it would have much better ratings on Amazon. Also, the fact that the customer who called Ronco reporting her incident of the trays melting was told to buy a new one, for the same full price, to replace her old one, not only demonstrates how cheaply the food dehydrator was made but also the character of the company. As I said earlier, it is important for every company to have honesty, integrity, and accuracy, and if this really is the way that Ronco treats its customers who have had problems with their product, then they do not have much integrity at all. So overall, I don’t recommend you buying the Ronco Food Dehydrator. I personally would never buy something that has this many bad reviews, so I wouldn’t recommend you to, either. However, if you want to take a risk and try out the Ronco Food Dehydrator, then I would say you have a good 50-50 chance of it turning out great or bad. So, if you give it a try, maybe leave a review yourself!